← No Quit in My Sis – Running for a Cure! Training Update – Stop Thinking About It! Hope your 4th of July weekend is going great! Quick update on my 50 mile July 4th training run…great weather led to some great miles on Friday! 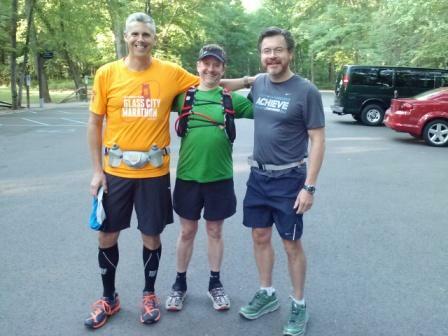 I ran the Scout Trail at Oak Openings in Northwest Ohio with a couple of running friends, Dave and Joe…Dave is also getting ready to run the Eastern States 100 on August 16th and Joe is going to be doing the Oil Creek 100k on October 11th. Big stuff coming up for everyone! Dave and Joe both had a good run with Dave doing 45 in just over 9 hours and Joe putting in 30 at a fast pace. My run was decent…I was shooting for 10-12 hours, nice and easy, and finished in 10:40…right in the zone. The trail was awesome! Saw a buck, a snake, a black squirrel, a gazillion brown squirrels, smelled a skunk (glad I missed him), heard a turkey, crossed paths with half a dozen horse back riders, and there were a lot of people out at the park celebrating the holiday with their families. It was nice! For Liz and George and all our Honorees! That’s what matters…no quit! Please consider a donation for LLS and cancer research. We need all the help we can get to fight the good fight. Thank you! This entry was posted in Running and tagged Coaching, Cure for Cancer, ES 100, Honorees, LLS, Marathon, Motivation, Oil Creek 100, Running, Success, Team In Training, TNT, Ultra-marathon. Bookmark the permalink.